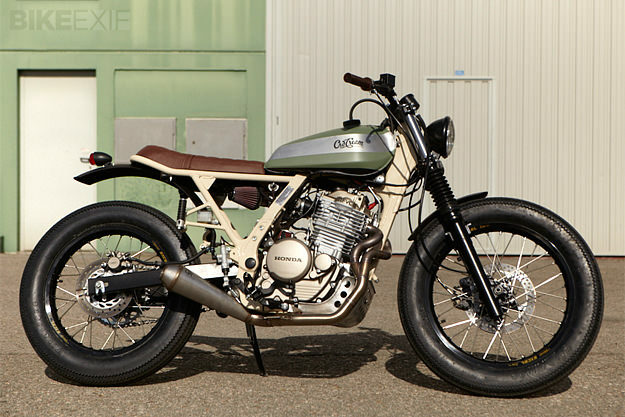 I’m starting to wonder if the NX650 is set to replace the CB750 as the favorite Honda platform for custom builders. In Europe, a Honda Dominator is easy to find: it was the ubiquitous inner-city dispatch bike. Tough, reliable and comfortable on the dirt as well as the asphalt, it’s an underrated all-rounder. 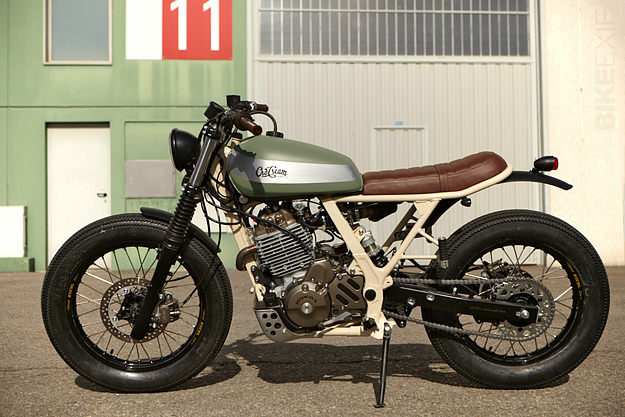 This is another NX650-based traffic stopper from Spain’s Cafe Racer Dreams. 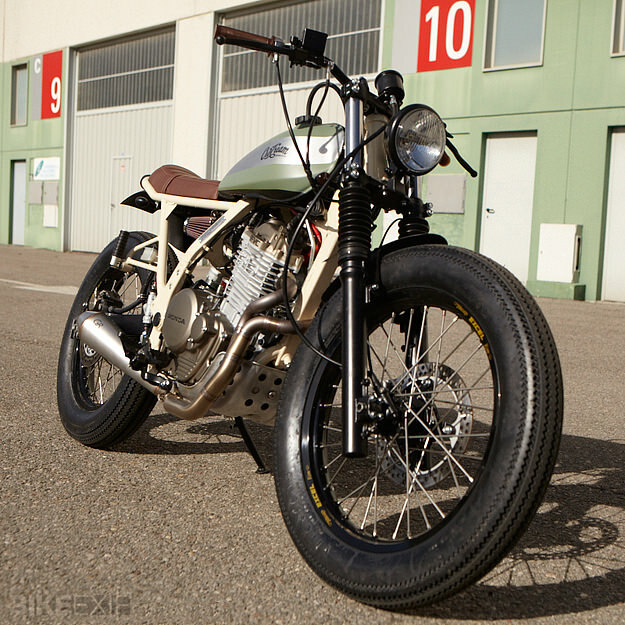 Built for a client based in the Mediterranean town of Nice, it’s sporting an alloy tank from a Yamaha XT500. The sleek new look is enhanced by black Renthal Ultra Low bars and CRD’s own lights front and rear, also finished in black (and now on sale in their stylish online store). 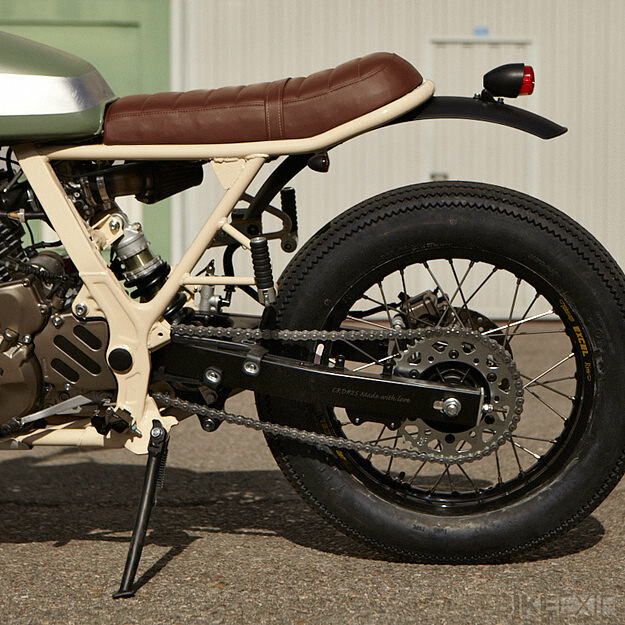 The battery is now hidden under the seat, which is custom-fabricated in vintage-style brown leather—a perfect foil for the green and silver tank and sand-colored frame. The NX650’s bulletproof 644 cc air-cooled motor—good for 50 mpg—required no modification, aside from a K&N intake and a sinuous custom-fabricated exhaust system, which now exits much lower than stock, down by the swingarm. 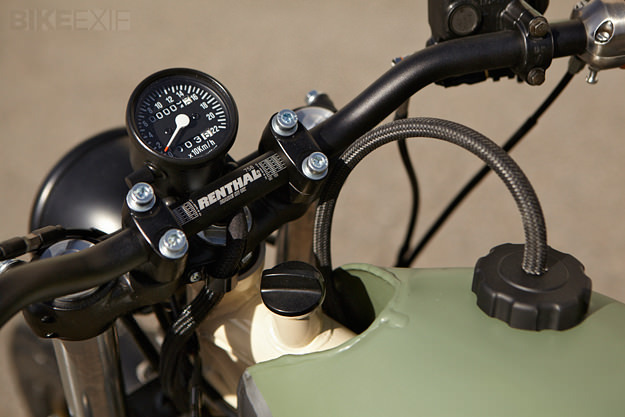 The standard rear shock, a weak point on the NX650, has been upgraded to an Öhlins item, and the rims are Excel. The front wheel has gone down a couple of inches in size to 19”, and the rear has gone up an inch to 18”, for a more balanced look. Who ever thought a Dominator could look so stylish? 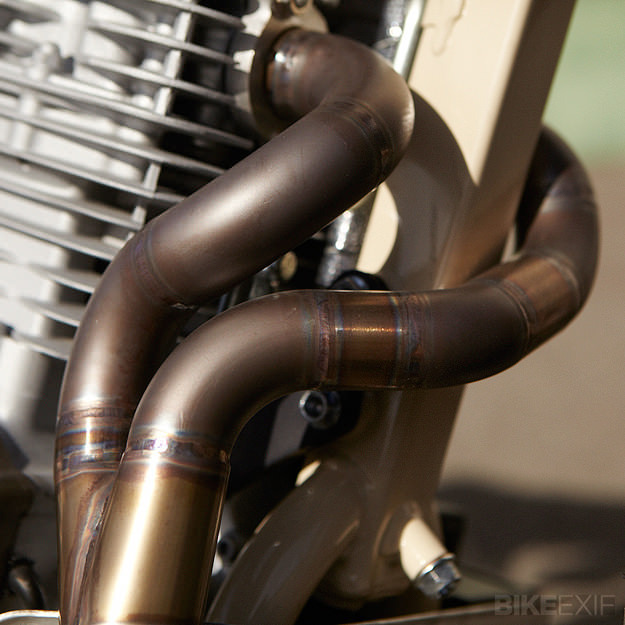 Check out more NX650 inspiration in the Bike EXIF Archives, and keep up with CRD’s news on their Facebook page.